The new has come. It’s a new year. It’s a new season. And it can be the first day of a new life for anyone who is ready to do what it takes to become new. 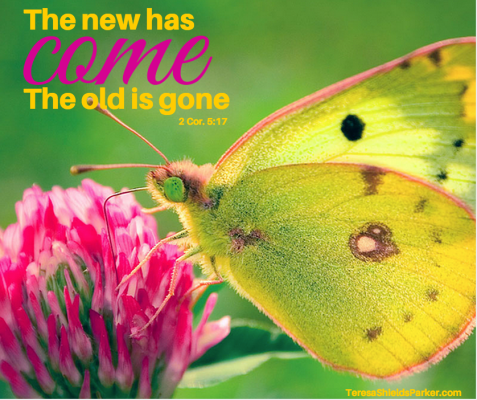 Embracing change is not just a nice concept, it’s what we are here on earth for. It’s interesting that the start of a new year comes right after tearing into dozens of new packages with new things. Also note how long the new lasts. We never want to give someone a used item for a gift, however the item will used as soon as it is opened. It only takes seconds for anything material to become old. I’d love to invent something that would never be old or wear out. Even God didn’t do that. Or did He? Much like the salad dressing in my refrigerator, we all have expiration dates. It is appointed to us once to die.1 God said every day of our lives were recorded in His book before a single one came to pass.2 That means to me they have an end or do they? This is no Sunday-morning-only belief. This is a belief that turns your entire life upside down. It is transformational belief. It is belief that makes everything you have been doing old, used up to the point that it needs to be discarded. Paul says it this way. “Therefore, if anyone is in Christ, the new creation has come. The old has gone. The new is here!”5 This can be a bit bothersome for those of us who have grown up in the church. My father was in Bible college when I was born. There has rarely been a Sunday I have not been in church unless sick or gone and not near a church. Nothing substantially changed when I became a Christian at age seven. There was no big transformation from age seven to eight. At least not on the outside and really not very much in my behavior except that I now knew I wasn’t just obeying my parents, but God as well. Here’s the interesting thing. I have, as all humans do, grown older. End-of-life issues are much closer when you reach 60 than when you are pressing 10. However, God says I am continually being changed into His glorious image. I am always being made new. This is a good thing because as I am paying to have my gray hair colored and slathering on lotion to cover wrinkles, something new about me sounds pretty good. However, as we grow older we are only growing more new each day. We getting closer and closer to the image God planned for us when He first thought of us. No one knows what heaven will be like exactly, but this one thing I do know. It is NEW. And in order for us to be admitted we will be given new and glorified bodies. However, we still be ourselves. Which means the lessons we’ve learned here will be of use in that place. It is to our eternal destination that we will take the lessons learned here in this earthly body — our character, our soul, our spirit, the works we did,10 the essence of who we are. It is just that we will have so much that is new, we won’t have time to worry, fret or be anxious. We will be in the presence of perfect love and nothing else will matter.. So here’s the truth, if we want to be everything we can and should be for eternity, we need to embrace all the changes God wants to throw our way. Because in the final analysis, change means we are headed somewhere glorious! We need to dress in our finest — and since clothes won’t be an issue, that means who we are must change at our core. It took many many years to understand how important change is to God and therefore, to me. I believe it is the purpose of why we are here. This is the training ground. To learn the lessons we will use in eternity, we must embrace change. We must be excited about continually being made new. I’m ready. How about you? 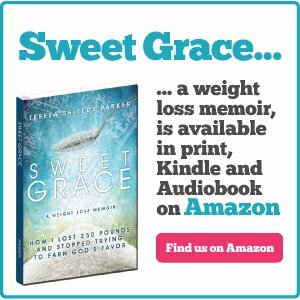 JOIN SWEET CHANGE and get our best price for ONLY a TWO-MONTH commitment now through Jan. 5 (Psst: the special is still up. Don’t tell anyone but you can still sneak in at the special rate.) 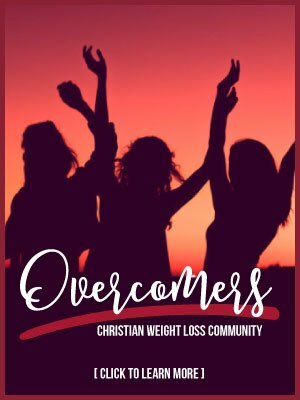 Check out Sweet Change Weight Loss Coaching and Accountability Groupfor the transformation of your life! 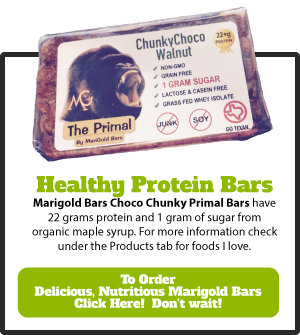 Just click this link for more info>>>Sweet Change. 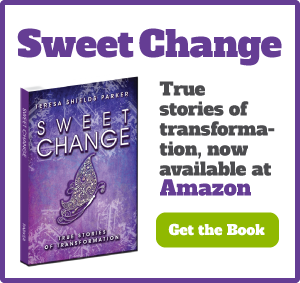 Sweet Change: True Stories of Transformation includes stories of weight loss and change from 18 ordinary individuals, yes, Teresa too! 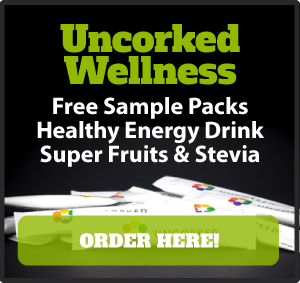 Plus additional information from Teresa Shields Parker. 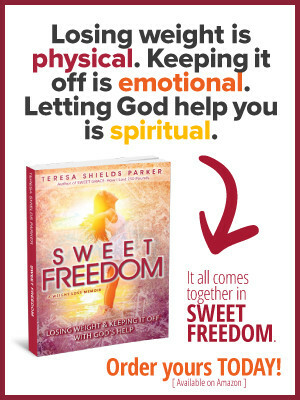 Get your copy as an instant download by going here https://teresashieldsparker.com/sweet-change-order/ . For a print copy, go to Amazon HERE.